Please note: This tidal data is in GMT and is provided for guidance of anglers only. If you are planning a voyage that relies on correct tide times, please confirm the data with an official tide table. NB: It is very dangerous to walk between Lyme and Charmouth on a rising tide. Several visitors each year get stuck on Church Beach and have to be rescued by the lifeboat. Why do the tides change anyway ? The animation below shows the gravitational action of the sun and moon on the earth's oceans, bringing this dynamic process to life. The world's oceans are in constant flux. Winds and currents move the surface water causing waves. Ocean levels fluctuate daily as the sun, moon and earth interact. As the moon travels around the earth and as they, together, travel around the sun, the combined gravitational forces cause the world's oceans to rise and fall. Imagine the earth covered completely by water. As the earth spins, this water is balanced evenly on all sides by centrifugal force. The moon has a gravitational pull on this layer of water as it orbits the earth. This pull causes the water to bulge toward the moon. Because the earth is spinning there will be a bulge on the opposite side of the earth as well. As the earth rotates on its axis, each location on the earth will experience both tidal bulges. The areas of high water levels are high tides and the areas of low levels are low tides. Since the earth and the moon rotate around the sun, there is an added modifying factor. 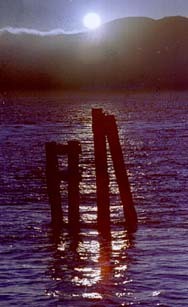 When the sun and moon are aligned, there are exceptionally strong gravitational forces, causing very high and very low tides which are called spring tides, though they have nothing to do with the season. When the sun and moon are not aligned, the gravitational forces cancel each other out, and the tides are not as dramatically high and low. These are called neap tides. Tides vary from day to day. As the earth, moon, and sun orbit, their positions constantly shift, causing slightly different gravitational effects. This causes the tides to occur at slightly different times. Tides also vary from place to place. Geographical position determines the level of tide. In Northern California there are two unequal tides each day. In the Gulf of Mexico there is only one high tide and one low tide each day.